Interview with Matt Gibbs, with excerpt from ‘Scar Gang’. Interview With Kate Harrad, with excerpt from ‘The Cult of Victor’. Interview with Stuart Boon, with excerpt from ‘A Rending Crack of Thunder’. Scott Purdy has been a full-time professional artist since 2000. His client list reads like a Who’s Who of the games industry and includes Paizo, Black Industries, AEG, Mongoose Publishing and Green Ronin. Though Scott’s work for games is allencompassing, he has also worked with children’s educational publishers, as well as designing t-shirts and even figurines. May of 2010 sees the publication of Scott’s second book “How to Draw and Paint Vampires” for Impact Books. His first, “How to Draw and Paint Goblinoids” is available on both the UK and US Amazon stores. You will also find there links to his galleries and to his fantastic ‘live sketches’ on YouTube. We are interested in using you for book covers. Please let us know if you are interested. Hey Lawrence, the site owner has just let me know about your post here, you can email me on purdyillustration@yahoo.co.uk to discuss work options. 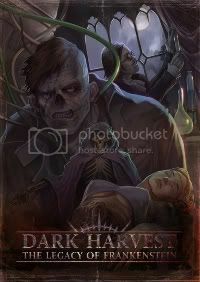 Dark Harvest: Legacy of Frankenstein is a detailed, fascinating roleplaying game setting, a terrifyingly plausible alternative history and a fiction anthology; a gothic horror fantasy that will appeal to gamers and the general public alike. The Health Spa – OF DEATH!! !